T-cell lymphoma in dogs, also known as canine lymphosarcoma, is a type of malignant cancer that attacks white blood cells known as T-cells. The disease usually begins in the lymph system or in the bone marrow, and it will eventually spread to the rest of the body if not treated. Symptoms of T-cell lymphoma in dogs vary depending on which organ systems the cancer has spread to first. In most cases, the first sign of this disease is a swollen lymph node, which may grow to such an extent that the dog’s owner notices it through touch. T-cell lymphoma may also cause small tumors on the skin (normally around the chest or leg areas) or in the mouth. Additional symptoms of this disease include: loss of appetite, vomiting, lethargy, depression, fever, weakness, abdominal pain and weight loss. The most definitive diagnosis of canine lymphosarcoma is obtained through a microscopic examination of lymph tissue. The tissue is obtained through a biopsy, which is collected while the dog is sedated. Microscopic evaluation of the tissue will determine whether the dog’s symptoms are caused by canine lymphosarcoma or another type of condition (such as leukemia), and the evaluation will identify if the cancer is T-cell lymphosarcoma or B-cell lymphosarcoma. Chemotherapy treatments administered through intravenous routes are the most effective treatments for T-cell lymphoma in dogs. These treatments are given on a weekly basis for approximately 6 weeks and then reduced to every two weeks and then to every three weeks. Dogs tolerate chemotherapy very well and usually do not experience the side effects that are associated with chemotherapy treatments in people. Canine T-cell lymphoma has a poorer prognosis than B-cell lymphoma cases, but with both of these cancers, dogs do not usually live longer than two years after their diagnosis. Dogs with T-cell lymphoma tend to have less of a response to chemotherapy treatments and a shorter remission period. 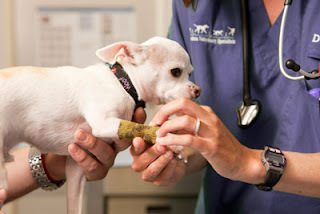 However, if the disease is caught in the early stages, a dog’s chances of extended survival are much better; for this reason, it is important to see your veterinarian immediately if you notice any unusual lumps on your dog or additional symptoms associated with this disease.